Computer issues will occur sooner or later on your PC. Fixing those problems isn’t always a simple task, but there’s one Windows tool that can help you. 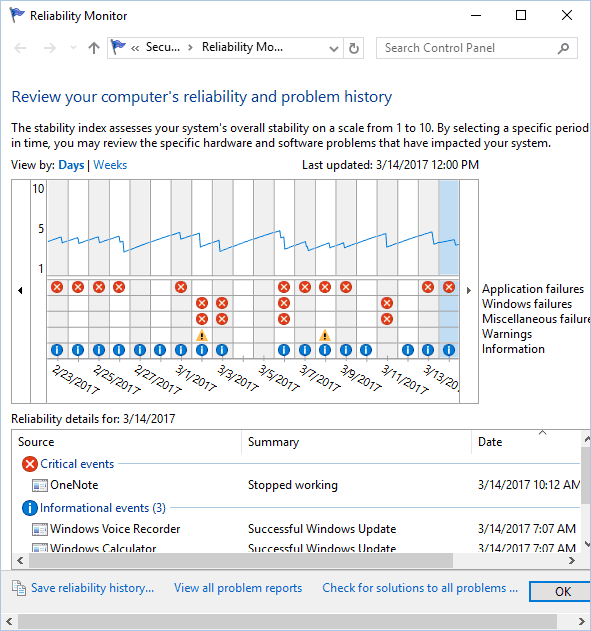 If you want to check reliability history on Windows 10, today we’re going to show you how to use Reliability Monitor. 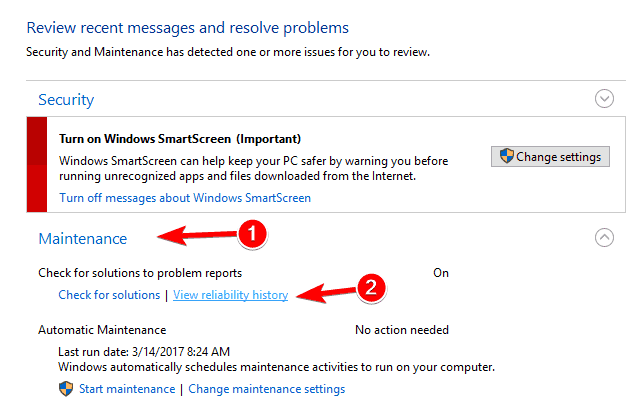 How to use reliability history to fix problems on Windows 10? 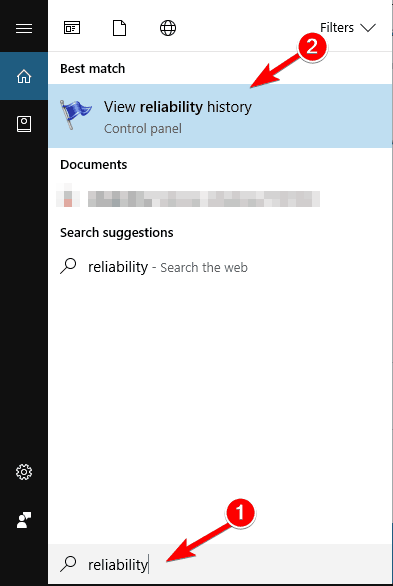 Windows 10 has a useful feature called Reliability Monitor. In fact, Reliability Monitor was part of Windows since Windows Vista, so it’s not an exclusive Windows 10 feature. The application uses a simple interface, so you can easily find a specific error. Since Reliability Monitor allows you to view reliability history, the tool is perfect for troubleshooting any issue. 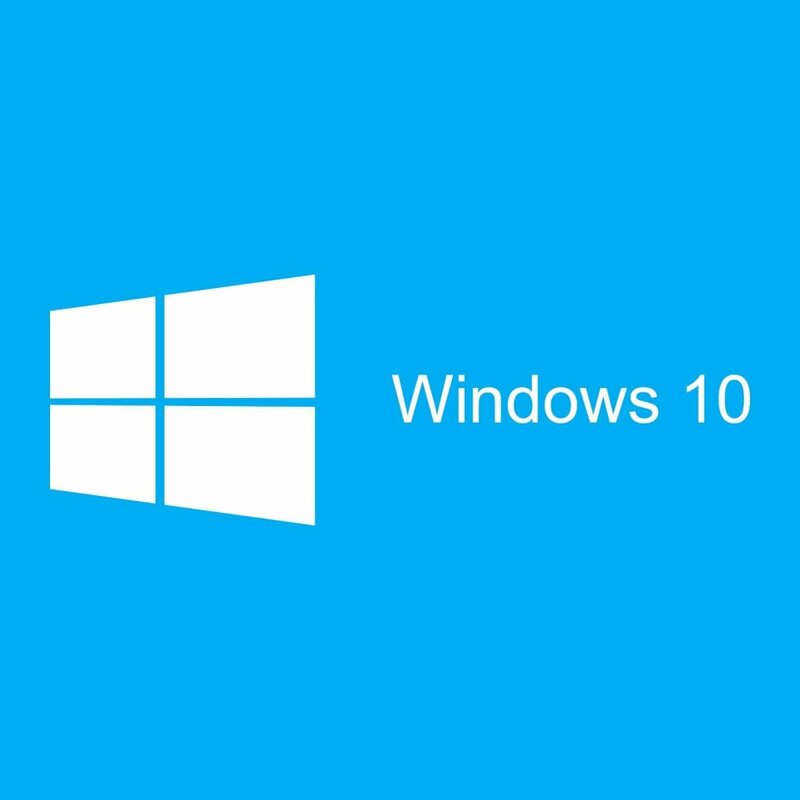 Windows 10 keeps track of errors and system failures, and thanks to this feature, you can easily learn more about specific errors that occurred in the past. Press Windows Key + S and enter reliability. Select View reliability history from the menu. 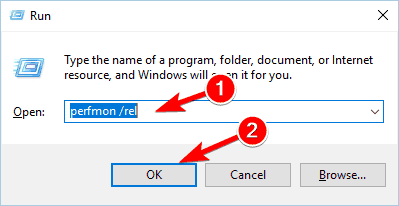 When the Run dialog opens, enter perfmon /rel and press Enter or click OK.
Press Windows Key + X to open Win + X menu. Choose Control Panel from the list of options. When the Control Panel opens, navigate to the System and Security section. Now navigate to the Security and Maintenance. When the Security and Maintenance window opens, expand the Maintenance section. Now click on View reliability history. Reliability Monitor has a simple interface, so even the basic users should be able to use it. The main window will show you a graph that represents your system’s stability. Stability is represented by a number ranging from 1 to 10. If you don’t experience any errors or crashes in a few days, your stability graph will gradually increase. Even if your stability index is somewhat low, it doesn’t mean that you have any major problem with your PC. Stability index will change whenever you encounter an error or even if a certain application crashes. Bellow the graph you can see a number of icons that represent certain events. The red X icon appears if you encounter a critical event. The critical event usually means that certain application crashed or stopped responding. There are also warnings represented by a yellow triangle. These warnings appear due to unsuccessful application removal or installation. Lastly, there are information icons available. These icons appear if you install an update, application or a driver successfully. Reliability Monitor also offers detailed information for each day. Simply select a specific day on the chart and you’ll see a detailed report at the bottom. From there you can see which application caused a warning or a critical event to appear. In addition, you can also see the type of critical event or warning. Lastly, you’ll see the exact time and date when a specific issue occurred, which makes it easier for you to troubleshoot a problem. Of course, you can click each warning or critical event to see extra information about it. You can see the exact location of the application, as well as the error code for certain problems. This can be rather useful if you want to troubleshoot and solve the issue on your own. The application also allows you to see all reports in a single list. By using this feature, all your errors will be sorted by application. This lets you see easily how many errors or crashes a specific application had. In addition, this also allows you to easily find the most unstable and problematic applications on your PC. We also have to mention that Reliability Monitor allows you to save reliability history in XML format. Although XML report lacks advanced information, it’s quite useful if you want to quickly view a summary of your reliability history. The application also has an option that allows you to check for solutions to all problems. This might help with some problems, but if you’re having issues with third-party applications, you’ll have to fix them manually. You can also right-click any warning and choose Check for a solution option. However, it most cases the issue won’t be fixed automatically. 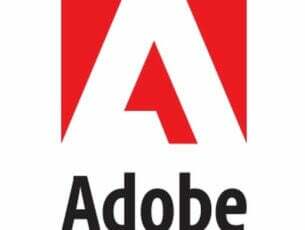 If you’re having issues with your hardware or any other major computer error, we advise you to download this tool (100% safe and tested by us). 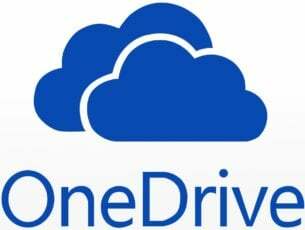 This application can fix various PC problems, such as hardware failure as well as file loss and malware. Many advanced users are probably familiar with the Event Viewer. This is a powerful tool that can detect every event, warning or error. Reliability Monitor uses the information from the Event Viewer, but it displays it in a user-friendly manner. If you’re having any issues with your PC, we advise you to check your reliability history by using this tool.